One of the most unusual aspects in the history of the Onan Company is the fact that never once in the 60-plus years it has been in existence has it ever failed to produce an annual profit – a feat matched by very few U.S. businesses. Sometimes the profit was small, often it was less than had been projected, but there never was a losing year. That doesn’t mean, of course, the company was without its normal share of problems. In each decade it seems that a crisis of one type or another was constantly threatening the well-being of Onan, especially during the firm’s first 40 years. In the 1920s it was the serious lack of capital. In the 1930s it was the overwhelming Great Depression. In the 1940s it was the traumatic shift; from hectic war production to a civilian market that had been nonexistent for four years. These problems all have been explored in previous chapters. The 1950s presented a totally new problem, never present in the previous 30 years. The Onan Company began to stagnate. It was an insidious situation, difficult to diagnose, but all the signs of stagnation were there. Sales were sluggish and declining, there was not the usual parade of new products, costs were rising and profit margins falling, there was a lack of long-range planning, budgets were lax and were not being met, and management was beginning to get top-heavy. D. W. Onan, his sons, Bud and Bob, and other members of management were well aware of the problems and were working hard to correct them, but in retrospect it is clear that the zip that had marked the company during its first 30 years was missing. As the 1950s began, D. W. Onan was approaching his 64th birthday and, after a lifetime of battling the day-to-day business problems, he was running out of steam. As president. Bud Onan was making many of the top management decisions, but he, too, was beginning to tire after those hectic post-war years that had threatened the very survival of the company. The company had only 440 workers as 1949 came to a close, compared to 2,500 only four years earlier, but at least the hectic transition to civilian production had been completed and it was again business-as-normal. Then in the summer of 1950 the Korean War started and orders from the U.S. military again began to flow into the Onan plant. Business picked up, the Arrowhead plant was reactivated and workers were added, but the boom was short-lived. Annual sales hit a peak of $17.4 million in 1952 and employment topped the 800 mark. For the rest of the decade, however, sales declined, going to $15.3 million in 1953 and hitting a low of $11 million in 1958. By now Bud Onan was in full charge of the company. D. W. Onan had suffered a stroke in 1954, and although he partially recovered, he never again was fully active in running the company. D. W. Onan died in 1958. 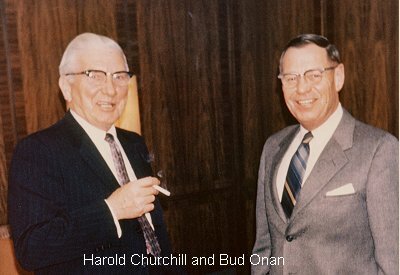 There were many factors, including the death of the founder, contributing to the stagnation of the company during the 1950s, but none was more important than the simple fact the Onan family no longer was willing to gamble everything it owned to help the business grow. It was much easier in the beginning. There wasn’t much at stake, and gambling everything seemed the natural thing to do. In the 1950s, however, the Onan family, through years of hard work and sacrifice, was relatively well off and financially secure. It just didn’t make sense to pour all they had earned over the years back into the company and take a chance of losing everything. Without large amounts of new capital, however, the Onan Company couldn’t possibly achieve the growth of which it was potentially capable. By the end of the 1950s, the Onan Company was ready for a badly needed blood transfusion. The Onan family wasn’t actively seeking a buyer for the company, but when officials of Studebaker-Packard Corporation approached them with an offer in 1960, there was immediate interest. Studebaker-Packard, formed by the merger of the two companies in 1954, was based in South Bend, Indiana, and it, like Onan, was having problems — only of a different type. Studebaker-Packard was fighting for its life in the automobile business with all signs pointing to the fact it was losing the battle. Corporate strategy had dictated that Studebaker-Packard had better get into other product lines, and it was sitting on more than $100 million in tax credits that could immensely help in a program of acquisitions for the purpose of diversifying. Studebaker-Packard offered to buy total ownership of the company from the Onan family, provided Bud Onan stay on as chief executive officer. The Onans accepted the offer, and in October, 1960, the company became a division of Studebaker-Packard. There was a multitude of reasons why the Onans were willing to sell the company. The price was considered fair. The new owners could invest the capital that was badly needed to keep Onan growing. There was an immediate need for a million dollars to tool up for the new J Series engines that Onan had on the drawing boards, and another half-million to add an engineering building to the University Avenue plant. Then there was the sizable tax liability owed to the federal government by the late D. W. Onan’s estate. There were personal reasons too. Bud Onan’s wife was anxious that he slow down his pace and lessen his concern about the future of the company; Bob Onan was in ill health and anxious to leave the company. The sale of the Onan Company to Studebaker-Packard came as a shock to the company’s employees. Following the shock came deep concern that the inevitable changes would mean it no longer would be the pleasant place to work that it had been. Bud Onan’s letter to all employees immediately after the sale tried to reassure the workers that the changes would be good for the company and for them, and that he would still be around for a long time. But the employees were still apprehensive. “I can answer that question without qualification. Yes, I do believe that we can continue to have everything that we have now – and more! We can keep our philosophy, our programs, our benefits, and our profit sharing. We can have security, opportunity, and a rewarding future. I do not believe that anyone is going to move in and take over, with new management or new policies. I have some very practical reasons for my confidence. “Of course, we all expect to stand up and be counted. We’re responsible for our results here. No matter who the stockholders are, whether it’s a single family or thousands of people, we have to keep this business healthy and profitable to justify our work. That’s true under any circumstances. Only we can guarantee our future, but we have everything we’ve ever had with which to do it, and more. “Make no mistake. I, too, was uneasy when the change was first announced. I have a big personal stake in what happens. In a few weeks, I’ll have 19 years with Onan. It’s most of my working life. If there really was a threat to this way of business life, I’d be disturbed as well as any of you. “I think all of us react to change in much the same way. We first react emotionally, and then we apply reason to the facts. I’ve been through both stages. I’ve had a chance to calmly look at what’s happened, why it’s happened, and what it means to us. “First of all, let’s look at what’s actually happened. All that really happened was that the owners of the stock changed from a few people to many people. The physical character of the capital assets of this business is exactly the same. In other words, we have the same building, equipment and tools that we had before. “Our most important asset remains the same. The people who built this business, each and every one of you, are still here to pool abilities, skill and experience toward a common and mutually profitable goal. So, we’re the same people, working with the same facilities as we always have. Shea’s reassuring letter helped calm an unsettled situation, and workers quickly adapted to the change of ownership. Tom Valenty, who later was to become president of the company, remembers there were some dramatic changes after the sale — all for the better. He says, “We were now forced to plan, to prepare realistic annual budgets, to set new order and shipment targets, to come forth with a new product development program, a planned replacement of old machine tools, and much more. These changes gave Onan the blood transfusion it needed. The business grew from $15 million in sales in 1960 to $44 million by 1968. Studebaker-Packard proved to be good for Onan, and, just as important, Onan proved to be good for Studebaker-Packard. In 1966, for instance, Onan contributed 22 percent of total Studebaker-Packard sales, but it also contributed a hefty 55 percent of the parent company’s net profit for the year. In 1967, partly because of Onan’s strong performance, Studebaker-Packard was able to bring about a merger with Worthington Corporation, a Harrison, New Jersey manufacturer of compressors, electric power generating equipment and diesel locomotives. Onan’s new parent was now known as Studebaker-Worthington, Inc. In 1968, Bud Onan, who was then 58 years old, decided to retire after 42 years with the company. Before making his decision public, Onan asked W. Glenn Gordon, who was group vice-president: for Studebaker-Worthington and responsible for the Onan Division, if he would be willing to become chief executive officer of Onan. Gordon, who at the time was considering being transferred from South Bend, Indiana to Harrison, New Jersey, where the new Studebaker-Worthington headquarters was to be located, was agreeable. So was Gordon’s boss, Deraid H. Ruttenberg, chairman and chief executive officer of Studebaker-Worthington. So, after a 48-year history, Onan was being run for the first time by someone other than an Onan family member. Gordon introduced several changes to Onan in his years as chief executive, including improving the management team, sharpening the gross margin concept, which went from 22 percent to 36 percent in just a few years, and he started a vastly improved long-range planning program. Gordon also supported the planning of the Onan facility at Huntsville, Alabama. In 1972, Gordon was moved across town by Studebaker-Worthington to become chief executive of another division, Turbodyne, a Minneapolis manufacturer of steam and gas turbines and turbine-powered generators. Tom Valenty, who had become president in 1970, succeeded Gordon as chief executive officer. It also was in 1972 that a decision was made to sell 20 percent of Onan to public shareholders with Studebaker-Worthington retaining the other 80 percent. The 600,000 shares of stock were sold in March, 1972 for $19 a share and the stock was listed on the American Stock Exchange. Within a few months the stock price had soared to $44.50 a share, and it looked as though another smart move had been made. Deraid Ruttenberg, the parent company’s chief executive officer, had made the decision to take Onan public, and it wasn’t his first success along those lines. He earlier had sold some stock of another division, STP Corporation to the public at $25 a share and it quickly went to more than $50. But the stock market is a fickle place, and before 1973 had ended, investors had gone sour on the market and prices plummeted. Onan shares dropped from the $44.50 a share peak to a low of just under $9. In 1975, it was decided to take Onan private again. The 20 percent that was owned by the public, plus another 17 percent from Studebaker-Worthington, was sold to Hawker Siddeley, a London-based company with interests that include diesel engines and generator sets, among many other activities and product lines. Hawker Siddeley had just sold its DeHavilland Aviation division to the Canadian government for $39 million, and it wanted to invest that money in another North American company. Onan looked like a perfect fit. It offered $37.5 million for 50 percent of Onan, and the deal was tentatively agreed upon. Two days before the papers were to be signed, Studebaker-Worthington called off the deal. Later, Hawker Siddeley agreed to settle for 37 percent ownership, and that proposal was accepted. Hawker Siddeley still owns 37 percent of Onan, but Studebaker-Worthington is no longer the parent company. In October, 1979 the McGraw Edison Company, headquartered in Rolling Meadows, Illinois, acquired Studebaker-Worthington, and it now is the owner of 63 percent of Onan. Onan Family Foundation © 2019.